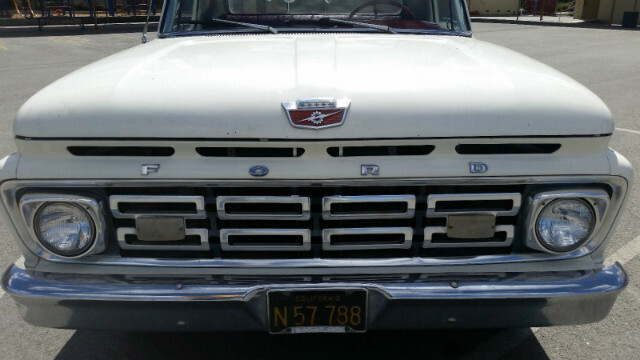 1964 Ford F100 Short bed Custom Cab, 292 V-8 3 Speed, Air Conditioning!, 88754 miles, Black Plate California Truck that I bought in San Jose and drove 1806 miles back to Texas without the slightest problem. This is an excellent running and driving truck, I had Leonard redo the seat, I converted the ac to R134 and recharged it, replaced an idler pulley bearing and installed a new belt, and I would be ready to head back to California in it tomorrow. If it sticks around long, it will likely get a few more upgrades as well. These 63/64 Shrtbed Custom Cab Trucks are getting harder and harder to find, especially rust free, unmolested original examples like this one. It now has a new set of aluminum wheels and white lettered Cobra radials and new drag link and drives even better.